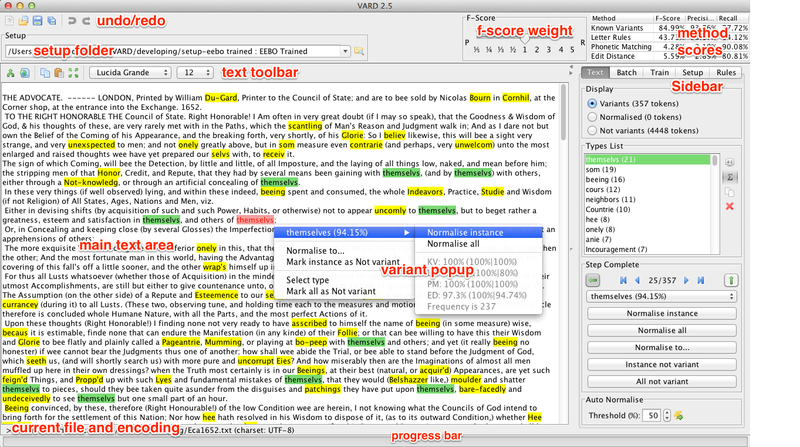 VARD 2 is an interactive piece of software produced in Java designed to assist users of historical corpora in dealing with spelling variation, particularly in EModE texts. The tool is intended to be a pre-processor to other corpus linguistic tools such as keyword analysis, collocations and annotation (e.g. POS and semantic tagging), the aim being to improve the accuracy of these tools. Various related publications are available detailing the tool and its uses. The tool is designed specifically for Early Modern English spelling variation, but the tool can be used to deal with possibly any form of spelling variation, in any language, by "plugging in" your own dictionary and spelling rules. Please contact me if you're interested in this. This site offers a user guide, FAQ and version history for the tool along with sections where you can report bugs and give feedback. If you'd like to use the tool, it is free to use for academic use, please see the availability section. This website was created and is maintained by Alistair Baron, the design and content are ©2008-2019 Alistair Baron.